Will Derrick Rose come back to be the MVP he was in 2010-2011? Derrick Rose was drafted 1st overall by the Chicago Bulls out of the University of Memphis. Rose quickly became a superstar and helped bring the Chicago Bulls back to the top. During the 2010 offseason, Rose persuaded Carlos Boozer to ditch Utah for Chi-Town. He also almost brought LeBron James to Chicago, which would have formed a terrific Big 3. Instead, LeBron went to Miami and became known as the most hated player in the league. 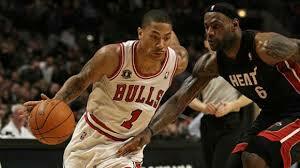 During the next season, Rose took the LeBron hate to his advantage by showing that he could be the next King. Perhaps King Rose. He won the MVP that year while averaging nearly 25 PPG and 8 APG. In my opinion, he only won the MVP because of everyone’s hate for LeBron, but it was still a great season regardless. Rose had risen to a superstar status that only LeBron James, Kobe Bryant and Kevin Durant were in. This was known as the top tier. People expected Rose to be an all time great that could possibly become a top 5 point guard of all time. However, the next year Derrick Rose finished banged up with hurt ankles during the whole season. Rose was not the same type of player and didn’t come up in any MVP conversations. Rose tore his ACL in the Bulls first playoff game against the Philadelphia 76ers. The Bulls played without Rose all of last year as he took a ton of criticism from the fans about how he should have returned. However, Rose’s decision was quite intelligent because if he came back last year, they wouldn’t have won a championship, so he might as well wait until he is fully healthy for when he takes on LeBron. Rose and LeBron look to form a rivalry tonight when Rose takes the court for the first time in the regular season since the 2011-2012 season. I think that Rose will return to MVP form because he has taken the time to heal. Can the surplus of busts from last year’s draft turn it around? Of the top 5 draft picks last year, only two of them, Beal and Davis, played extremely well. Dion Waiters played fine, and MKG played much below his expectations. Thomas Robinson, the fifth pick, has looked like a bust of Kwame Brown-level. So far, two teams in the Rockets and Kings, have given up on him, though he does have another chance with the Trail Blazers this year. The next, and final 9 picks of the lottery also had varying levels of success. Damian Lillard was amazing, Drummond and Barnes are both very good starters in the NBA, and Terrence Ross won the dunk contest. Though they played poorly, John Henson and Jeremy Lamb showed promise. Austin Rivers had, arguably, the worst stats of a rookie in NBA history, and Meyers Leonard and Kendall Marshall were just as bad. The bottom half of the first round showed the exact same trend, and that is, no trend at all. 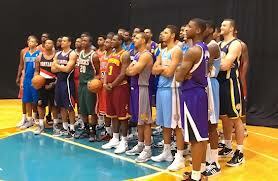 Mo Harkless, Jared Sullinger, Andrew Nicholson, Tyler Zeller and John Jenkins showed a lot of promise. Fab Melo played six games, and Royce White played none. Also, Terrence Jones, Evan Fournier, Jared Cunningham, Tony Wroten, Miles Plumlee, Arnett Moultrie, Perry Jones III, Marquis Teague, and Festus Ezeli all played far below their expectations. Aside from 12 or 13 players, this draft class really disappointed last season. That number of 12/13 would leave 17 or 18 players that could be considered “busts” thus far in their extremely short careers. Of those players, 7 of them were traded during the offseason, and 3 (Marshall, White, Melo) aren’t even on a team. Many people are expecting, if not hoping, for many of these players to breakout. I’ve seen Austin Rivers, John Jenkins, Jeremy Lamb, and John Henson on several lists of breakout players. But, will this draft class improve, or will they go down as one of the worst of all time? We’ll likely find out this season. Will the Brooklyn Nets be able to form chemistry and make a title run? The Brooklyn Nets had a good, but not great first year in Brooklyn. Deron Williams, Brook Lopez and 6-time all star Joe Johnson are all back from last years team. The Nets took the offseason by storm by adding key free agents like Andrei Kirilenko, Alan Anderson, and re-signing Andray Blatche. The Nets highlight of their offseason was the trade they made with Boston. This trade included future hall of famers Kevin Garnett and Paul Pierce heading to Brooklyn along with three point king Jason “The JET” Terry. The Nets threw Boston three first round picks for the future and along with the picks, the Nets sent Keith Bogans, MarShon Brooks, Gerald Wallace, Kris Humphries and Chris Joseph. This was not a lot to give up for Brooklyn especially considering that they got two future hall of famers for practically future picks and a bunch of scrubs who wasted a ton of cap space. The major question facing Brooklyn this season is will they be able to form chemistry in order to reach their goal of winning a ring. 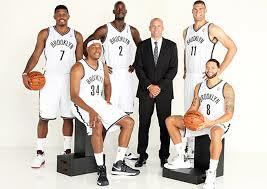 Many of the Nets players goals this season is to win a championship and this team sure enough has the players for it. Most of these players have huge egos, which could get in the way of their goals. Kevin Garnett and Paul Pierce have checked their egos at the door in order to win a title for the city of Boston. I think that the Nets can control this and create a pretty good sense of chemistry because they all are on the same page with their goals. The Nets, in my opinion, won’t win the championship, but have a possibility. I think they will lose to the Miami Heat in the Eastern Conference Finals. Will Knicks star Carmelo Anthony remain with the team after this year? Carmelo Anthony was traded to the New York Knicks at the trade deadline for nearly the entire team. 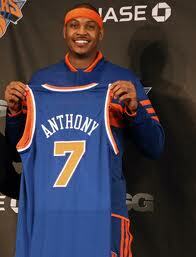 The Knicks marketed this move using the fact that Carmelo was born in NYC and always dreamed of being a Knick. During his first game, he came sprinting out of the tunnel with a huge video special and “I’m Coming Home” blasting around The World’s Most Famous Arena. Carmelo has been great for the city of New York, however he has not brought over success in the playoffs. Carmelo has already had his years as an all star and I believe he’s about ready to win a ring in a different city. Ultimately, he wants to win in New York, however he has stressed how important it is to win a ring and that isn’t very likely for the team playing across the bridge from the Nets. I could see Melo leaving in free agency to a team like the Los Angeles Lakers who have major championship aspirations. Melo has discussed how he is going to opt out of his contract with the Knicks. This doesn’t necessarily mean that he will leave, but it does mean that they he is going to want a lot of money and I think the Knicks won’t pay Melo what he wants because so far, the Melo-Championship Era has been a failure. I think he will opt in to his contract, which will delay his drama for at least another year. I hope you enjoyed this article! Enjoy the 2013-2014 NBA Regular Season! Tell us what you think in the comments section below about any of our story lines or anything that you thought are bigger story lines for this year! This entry was posted on October 30, 2013 by Dylan Bernstein in Analysis, NBA, Uncategorized and tagged BOSTON BLOCKBUSTER, brooklyn nets, Chicago Bulls, Derrick Rose, Fantasy basketball busts, kevin durant, Kevin Garnett, LeBron James, Los Angeles Lakers, Miami Heat, National Basketball Association, NBA, NBA MVP, NBA Opening Night, NBA regular season 2013, NBA rookies, NBA rookies 2012, NBA Superstars, NBA Tipoff, NBA Trade Deadline, New York Knicks, Paul Pierce, Rose.